Stone and tiles are one of the few parts of a building that can survive a fire or flood – stone and tiles that have been through a fire or flood will be extremely damaged, but they can often be restored back to original condition. Fire damaged stone will blacken from the soot and ash of the fire, usually penetrating deeply into the stone. Direct heat can do irreparable damage to natural stone; however sooting and smoke damage can generally be recovered. Tiles, on the other hand, are usually fired at a very high temperature and therefore direct heat is less like to cause an issue, so sooting and fire grime is the main source of damage. Often the grout lines will have suffered more damage than the tiles themselves. Flood damaged stone, by comparison, will simply look waterlogged. 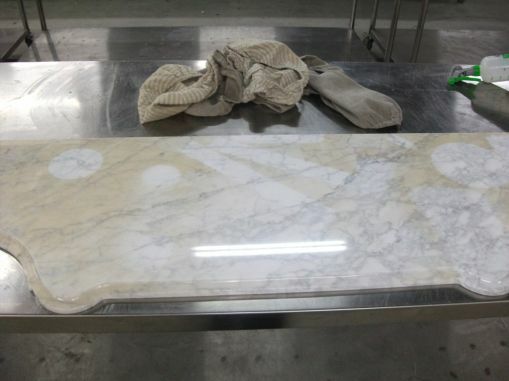 In some cases this process of water penetration can bring some of the natural minerals within the stone to the surface, which will look like stains. Typically this is visible as rust marks (from ferrous minerals) or darkening of the stone. As it’s very difficult to dry out waterlogged stone, it may start to grow mould or algae fairly quickly after the flood. Flood damage restoration involves extraction of the excess water, and specialist treatments to address any related issues such as mineral pigmentation. How effective is flood damage restoration and fire damage restoration? Flood damage restoration and fire damage restoration are both very specialist areas, but restoration can certainly be achieved. 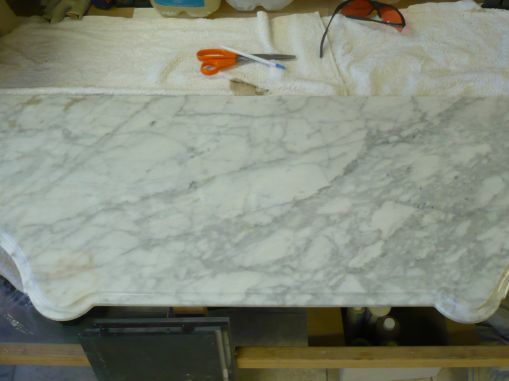 The stone or tiles have often been subjected to damage unlike any kind of day-to-day wear, and restoration is often very carefully undertaken by hand, with limited machinery used. Fire or flood damage restoration is not something that be completed yourself. You will need a specialist such as Slique, and your insurance company will likely cover the cost of restoration. If you have flood or fire damaged stone, book a free Slique Consultation – we’ll come and confirm whether we can reverse the damage, and give you a quote for our Technicians to professionally restore the surface to as-new condition. We are also happy to work with your insurance company where necessary.